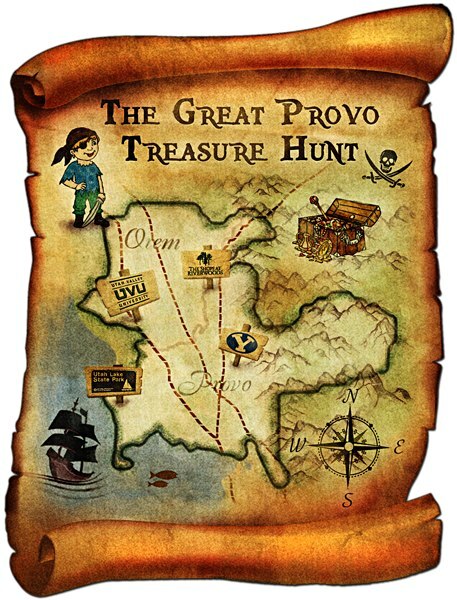 formerly phread: Provo Treasure Hunt? About 14 years ago, I worked in an office supply store. I worked at the customer service desk. When I didn't have customers, and when my chores were all finished, do you know what I would do? I'd grab a road atlas and study it. I love maps. I like being familiar with an aerial view of any place, which I know is quirky, but still -- there it is. 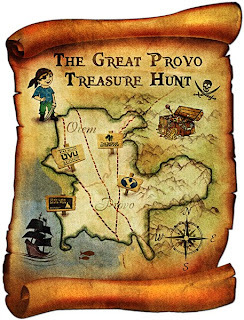 All this to tell you that I was really excited to learn about the Provo Treasure Hunt, which is exactly what it sounds like, except that it also includes Orem. Will my pseudo-cartography hobby help me in this hunt? We'll see. No, really, this is a thing. This guy, Duncan, explains it in his video on Provo Treasure Hunt's site. You can follow @ProvoTreasure on Twitter and like their facebook page. It begins in a couple of weeks. The prize? $5,000. If I had $5,000 I'd put it towards a car for our family. What would YOU do with the money? Do you think you can best my map knowledge? Will you be hunting for treasure? That looks fun, James is our map obsessive! He had to get special maps printed when we were in Provo as your maps aren't as detailed as our ordinance survey ones over here. He needed good ones to climb those mountains solo! I think that this would irritate me, because I would be serious about it, but would end up losing to some Zoobies who were in the right place at the right time. But I hope YOU win! I love you, but I'm going to beat you to it. If I find it first, I'll buy you lunch. When I win, I'm going to let 5,000 of my friends each order 1 thing off the dollar menu. I LOVE that you used the word cartography in your post! My husband went to grad school and got a degree in Cartography and GIS... you wouldn't believe how many people just give me a blank stare when I say that! I now say, Cartography and GIS - Maps. I love looking at maps too - have since I was younger.